Get ready for a long post people. The end of January marked the time for the first ever winter edition of Culinaria San Antonio Restaurant Week and although I’ve had over a month to recover, my belly is still happy about a certain pork chop. I have previously made sure that I hit up a few restaurants during San Antonio Restaurant Week in the past, so I was excited to hear that Culinaria decided that there should be two weeks throughout the year, the Winter and Summer editions. Culinaria is a not-for-profit organization dedicated to benefiting the San Antonio community and promoting San Antonio as an ideal wine and food destination. By way of providing culinary scholarships and aid to San Antonio’s chefs enduring personal hardships through our Chefs 4 Chefs programs, Culinaria has long promoted its support of the community. Culinaria is ever-growing and trying to find new ways to enrich San Antonio, and its next big endeavor in aiding the San Antonio community will take form in the Culinaria Urban Farm. The purpose of the Urban Farm will be to hone in on true nutritional values and education to promote a farm-to-table diet. Awesome, right? For a foodie who loves my city and the growth we are having, Culinaria is a dream come true. There were fifty-one restaurants that participated in the first winter edition. The restaurants varied in type of cuisine, location around the city, and normal price-tag. The fun part of Restaurant Week is that each restaurant participating has a special menu and price during the event, so I was able to try a few restaurants that I have previously avoided due to price. Depending on the tier of the restaurant, you can walk away spending $10-$15 for lunch or $25-$35 for dinner. All include a few courses, so you are definitely getting a great deal. You can view a full list of the restaurants that participated online. Zach and I chose to try out Oaks Crossing Restaurant & Bar, Wildfish Seafood Grille, Perry’s Steakhouse & Grille, and one restaurant that I will talk about a bit later. I often try to stay away from chain restaurants and my capstone project is specifically about local restaurants that are not national chains. But, for Restaurant Week, I was not filming for the project and thought that trying some smaller, national chains would be fun. So I had a mix of local restaurants and chains, to get me some perspective. 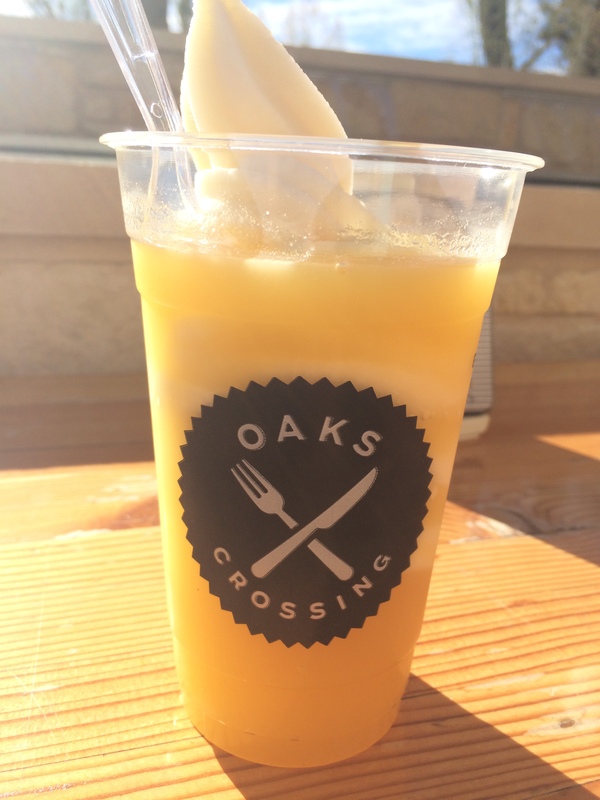 We started our journey at Oaks Crossing Restaurant & Bar, the restaurant at the H-E-B at Wilderness Oaks. The lunch menu included a salad, one meat BBQ plate, and a dream float for dessert. 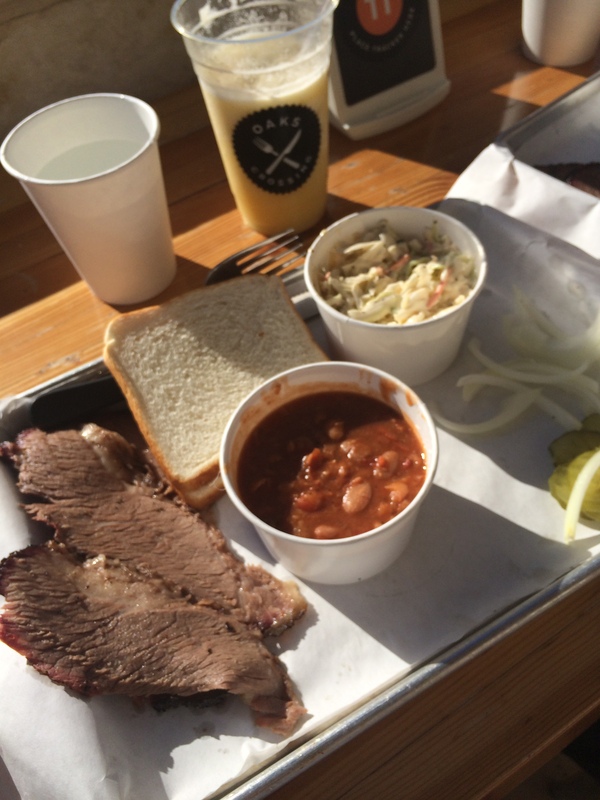 I had the Caesar salad, brisket plate with brisket beans and coleslaw. Zach had the garden salad, and chose the same plate. We both had the dream float, of course. 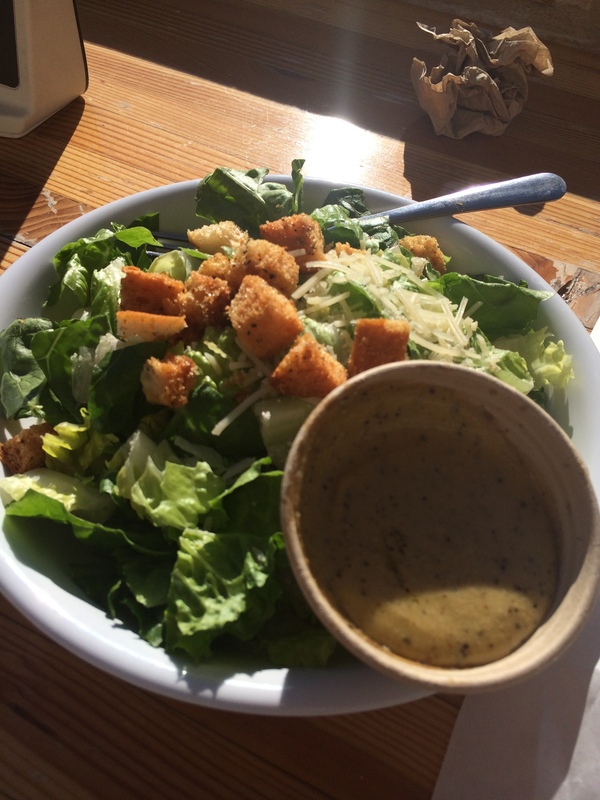 The salad was huge and the Caesar dressing was outstanding. It was not too thick, but still creamy and had a strong flavor. The brisket beans had a tomato flavor and were slightly spicy. The brisket was cooked well, and although it was not as lean as I normally like, I really enjoyed it. The coleslaw was saucy and had a somewhat citrusy taste to it. The Dream Shake was super sweet! It was pineapple soft serve with orange juice. It turned into a slush type drink right away and was definitely a fun, sweet treat. I was impressed with Oaks Crossing. I guess it makes sense that a restaurant in a grocery store would have interesting recipes and a lot of flavors to their food. The restaurant itself is also really casual and often has live music. They have a pretty large bar and the menu has much more than BBQ. The service was on point, people inside and on the outside patio seemed to be enjoying themselves, and you could bring your whole family and feel comfortable. Why not grab a bite to eat before you go grocery shopping? 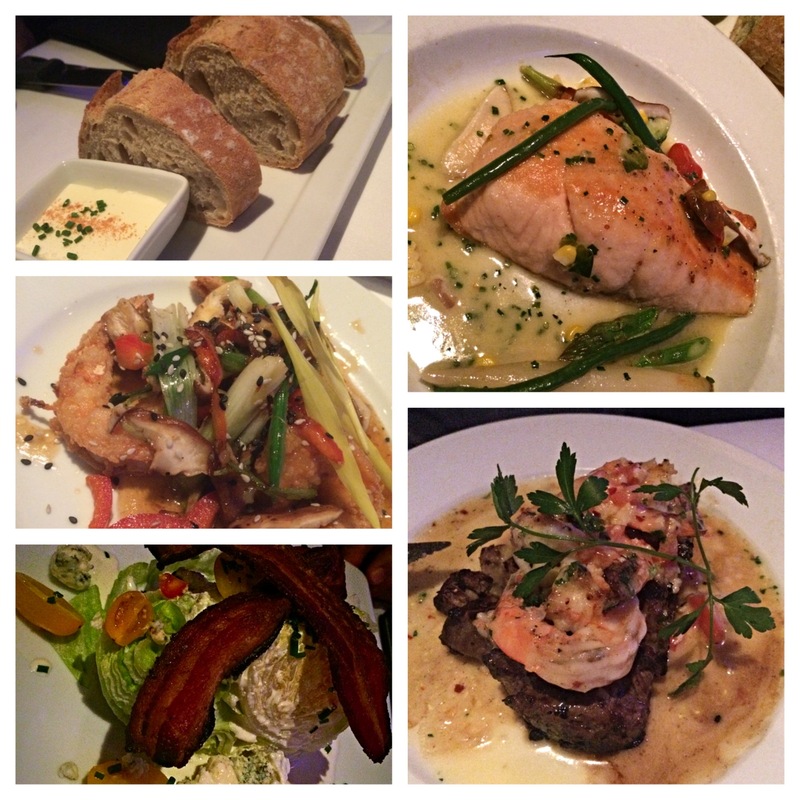 Part two of our restaurant week adventure was Wildfish Seafood Grille. Wildfish is a national chain, although there are only three restaurants in three different states, one of which is in San Antonio, Texas. See, our city is becoming a place where small national chains can grow! I had been wanting to try Wildfish because it is trendy and a bit fancy. Who doesn’t like putting on some nice clothes and eating in a dimly lit seafood restaurant every now and then? First I would like to point out that the place was packed on a Monday night! The bar in the middle of the restaurant had an extremely massive metal structure above it that looked like a fish skeleton. The restaurant was dimly lit and people in their mid-twenties and up surrounded the bar with nice looking cocktails in hand. They did have TV’s around the bar playing the Spurs, so it still had a more casual vibe than many “fancy” restaurants do. It was a crowd that I usually do not feel comfortable around. Mostly business people or older people and you could tell many parties were actually business type meetings of some kind. Zach and I each got a $35 dinner. I chose the crispy salt & pepper shrimp for my appetizer, Scottish salmon for my main course, and hot “Bananas Foster” butter cake for dessert. Yummmmmm. Zach decided on the Iceberg BLT for his appetizer, the beef filet medallions with gulf shrimp “scampi style” for the main course, and Belgian dark chocolate mousse for dessert. Again, yummmmm. Everything was delicious. The shrimp were spicy and came with a great sauce and fresh veggies. They served a very large piece of salmon and it was cooked perfectly. The sauce on top was a mustard vineggrette and it was the perfect bit of acid on top of the fatty fish. I literally could not stop myself from eating the entire dessert. 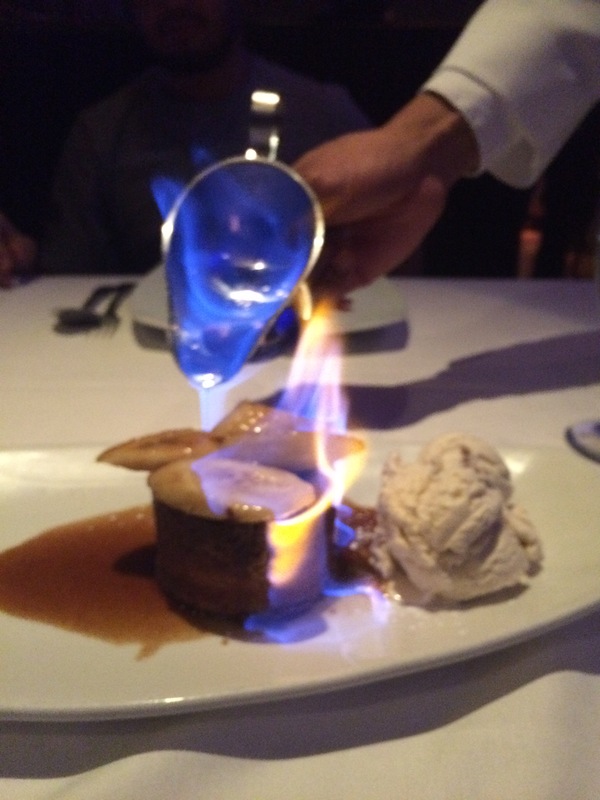 They lit it on fire when it reached the table and it came with butter pecan ice cream. I try to stay away from sugar to be healthy, but I decided I did not care this evening because it was too good. Go there for the food! 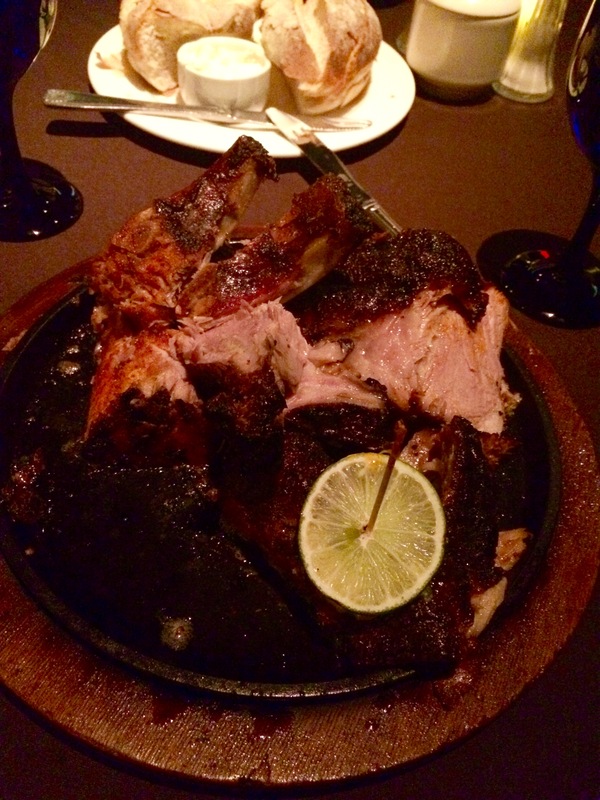 Part three of our journey took us to Perry’s Steakhouse & Grille. Another national chain, but again on a small scale. They have twelve restaurants, ten of which are in Texas. This restaurant was so much fun! I honestly expected to be around a bunch of people with their noses in the air and service that was great, but boring. I thought wrong. Although the restaurant has the look of a uppity place, including dark, decorative wood, white tablecloths, and chandeliers that actually made it bright inside, it still had a great energy where I could fit in, at least for the evening. The service was great. Our server cracked jokes and made us feel comfortable. It was loud inside because there were a ton of people talking and laughing. 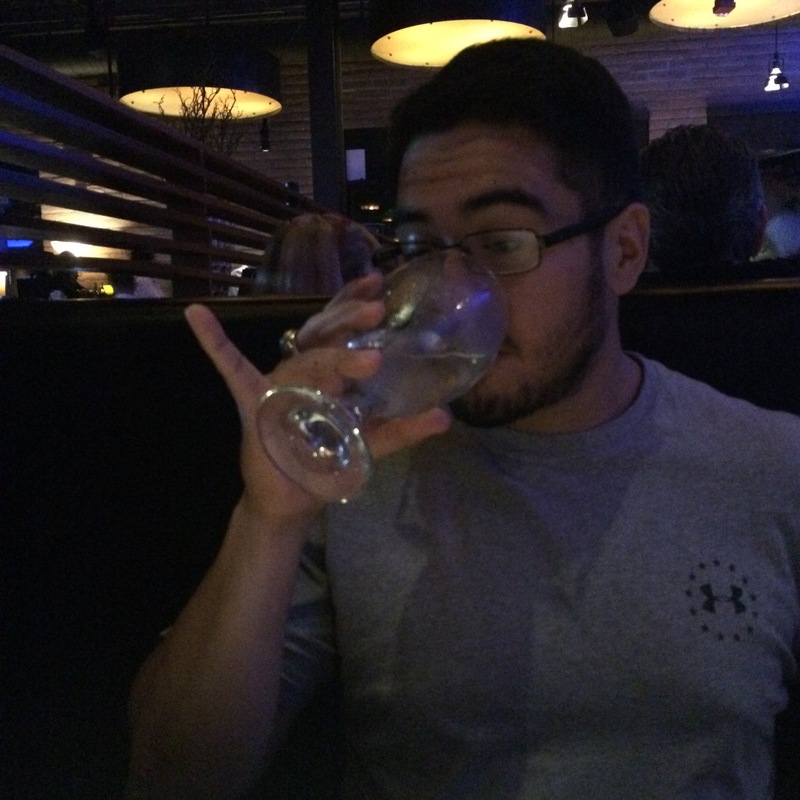 I felt like I could actually talk at a normal level and I could see everyone around me, unlike my experience at Wildfish. The dinner was $35 and three courses. Compared to their normal menu, this was steal. Zach and I both got the wedge salad for our first course. I got Perry’s Famous pork chop for my second course because I had heard many great things about it. Zach got the grilled salmon. All meals came with the dessert trio for the third course. 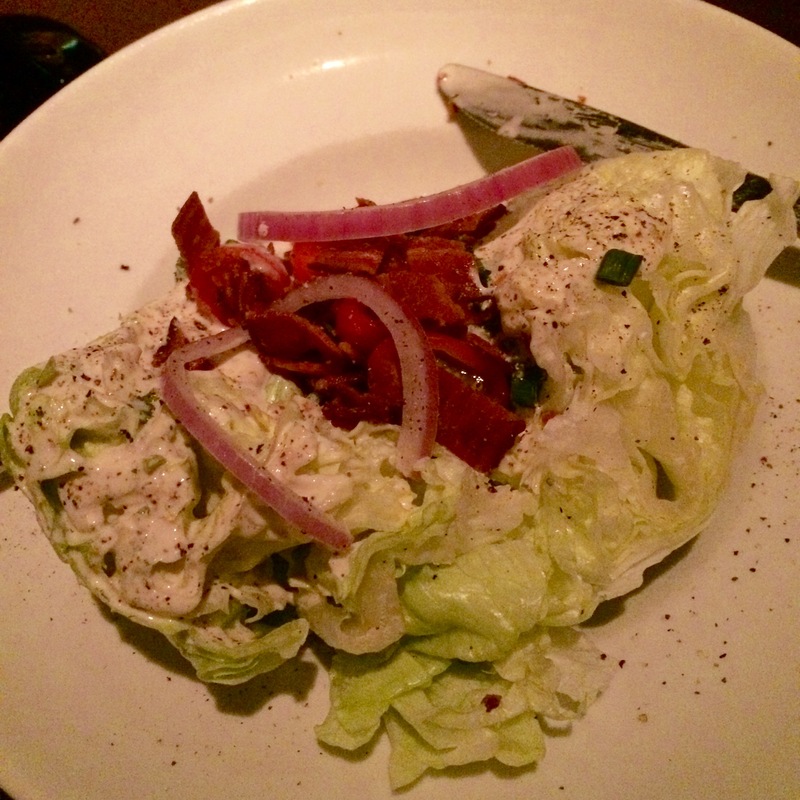 The wedge salad came with buttermilk vinaigrette dressing, instead of the usual blue cheese or ranch dressing. I promise you, this was one of my favorite salad dressings I have ever had. The dessert trio included a vanilla bean crème brulee, a Grand Marnier chocolate truffle and praline cheesecake. 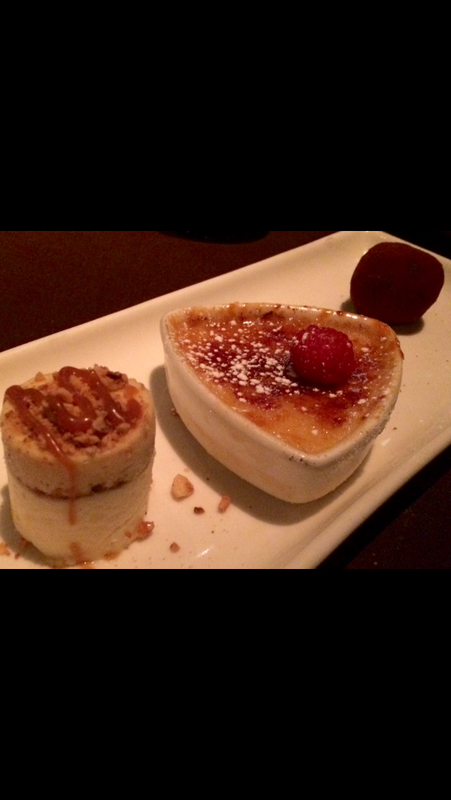 I was not a huge fan of the crème brulee, but I enjoyed both other mini desserts. I did not mention my pork chop above because it deserves a separate paragraph. OH MY PORKCHOP!!! If you have not been to Perry’s, you must go and get this pork chop. If you do not like pork chops, I still think you should try it because it is unlike anything I have ever seen or tasted. It seriously was one of the best meals I can remember having. It was gigantic, MASSIVE, insanely huge! I honestly do not understand why they call it a pork chop without an “s” at the end because I think it was four pork chops. It was like a pork chop cake and had multiple flavors and multiple parts of meat and sweetness and smokiness, and deliciousness…I may have lost my mind a bit. I know I got a great deal, but go spend some money on this if you have a bit of money to spend. Also, they apparently have lunch specials on Friday and some other special on Sunday, so it actually can be very affordable. It was outstanding! We tried one other place during Restaurant Week, but I will not say the name. We had horrible service and although the food was ok, I will not be returning for that reason. But I also will not let that one experience ruin the beauty that was Culinaria San Antonio Restaurant Week Winter Edition. Zach and I had a great time trying places that we had not been to yet and we had some wonderful food! I also learned not to judge a restaurant before trying it out. I may usually prefer more casual restaurants where I can be myself, but Perry’s was the best of both worlds because it was not casual, but I could still be me there. Don’t forget to take advantage of the Summer Edition of Culinaria San Antonio Restaurant Week, August 15-29, 2015.